You have decided to change the knobs and pulls on your kitchen or bathroom cabinets or furniture. Changing cabinet hardware is a great and inexpensive way to update the look. But with so many styles, how do you decide and what are my options? While there are no strict rules on how to select knobs and pulls, many decorators choose knobs for cabinets and pulls for drawers. I have seen plenty of pulls on kitchen cabinets, so that is not always the case. Many people find pulls easier to grip than knobs. Large pulls are preferred for larger drawers due to the weight. Knobs and pulls should be consistent with the style of the cabinets, lighting, and other décor. For example, if your look is contemporary, you should stick with contemporary knobs. Primitive style décor needs primitive hardware and knobs. With so many different styles available, it is easy to find just the right knobs and pulls for any style home. Shape is also important. Does square or round hardware compliment the cabinets? This is usually a matter of taste. Curved hardware is generally more traditional and has softer ed ges and greater detail. Pulls range from simple bars to elaborate Victorian style. Most manufacturers offers knobs and pulls that are part of a family of matching hardware so you can have a coordinated look to your room. The bin pull is a classic half-moon shaped pull that has been a favorite for generations and is suitable for any design styles. Usually made of brass and other metals, bin pulls are also available in glass in several depression era colors for a vintage look. Porcelain knobs and pulls date back generations, and add a vintage look to period style homes. Wooden knobs date back for centuries and are a good choice for Colonial, Arts and Crafts, and Traditional style furniture. 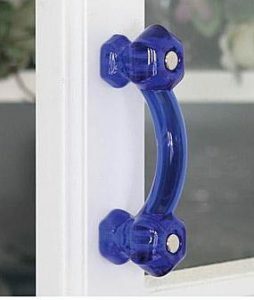 Ring pulls are popular on dressers and dining room buffets and are available in many shapes and styles. Styles include Primitive, Colonial, Eastlake, Victorian, Arts and Crafts, Art Deco, and Contemporary. Popular designs feature beaded rims, floral designs, basket weave, scroll, lion’s head, heart, Celtic, sunburst, and rope. 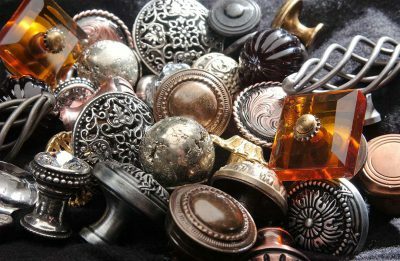 Knobs and pulls are made of a variety of materials includ ing brass, bronze, iron, wood, glass, porcelain, and synthetic materials. Finish is also an important consideration. Hardware comes in dozens of finishes with Brushed Nickel or Brushed Satin Stainless the most popular. Our friends at Hardware Resources recently introduced two new finishes, Honey Bronze and Ash Gray, and tell us that they have been well received. Pulls are offered in various lengths and are sized by boring, which is the distance between screws. If you are using a different sized pull than you are replacing, a back plate is a good way to cover the old holes while also adding dimension to the pull. 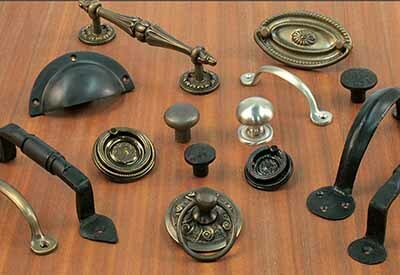 Van Dyke’s Restorers offers more than 2,400 knobs and pulls in every style, size, and finish to suit any project.